Itching to try your hand at PC gaming? Then listen up. 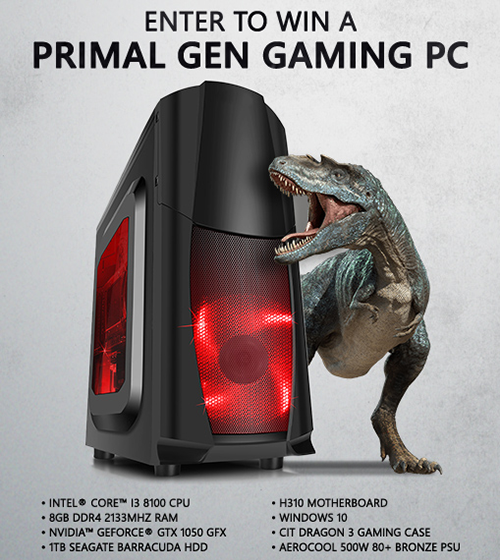 In partnership with London-based DinoPC, HEXUS is giving our UK readers the chance to win a Primal GEN Intel Gaming PC worth £569. This fully configured base unit comes equipped with an Intel Core i3-8100 processor and Nvidia GeForce GTX 1050 graphics, and we're giving it away for free! To be in with a chance of winning simply answer the following question to enter our free prize draw, and don't forget, you can also claim a second entry via Facebook! Need a clue? You'll find the correct answer at dinopc.com. The competition winner will be picked at random from all eligible entries that arrive by 22:00 London time on the closing date, June 4, 2018. The winners will be notified via email by June 11, 2018. The winner must claim their prize within 7 days of the promoter sending notification. If the prize is unclaimed after this time, HEXUS reserves the right to offer the unclaimed prize to a substitute winner selected in accordance with these rules. Decent budget build. A vast upgrade over what I have now. And nice to see a case actually having a front mesh rather than solid panel with side vents. USA out again, oh well there's always next time.